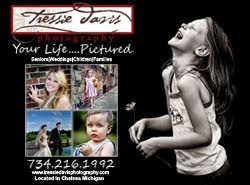 News From Tressie Davis Photography: Please Vote for Me! Tressie Davis Photography is one of the 25 finalists in the Lifestyle Portraiture Ad contest. Now it is up to our (adoring?) public to vote for their favorite ad. (or you could just vote for me...I wouldn't complain LOL). See my ad below, and vote for me HERE. You will have to scroll to the bottom of the page for the voting buttons, click on Tressie Davis Photography - one vote per ip address. Thanks a bunch to any/all that take the time to vote for me! !